This article is about laws created to enforce strict moral standards. For early Colony of Connecticut laws, see Blue Laws (Connecticut). Sabbath Eve, painting by Alexander Johnston. Blue laws, also known as Sunday laws, are laws designed to restrict or ban some or all Sunday activities for religious reasons, particularly to promote the observance of a day of worship or rest. Blue laws may also restrict shopping or ban sale of certain items on specific days, most often on Sundays in the western world. Blue laws are enforced in parts of the United States and Canada as well as some European countries, particularly in Austria, Germany, Switzerland, and Norway, keeping most stores closed on Sundays. In the United States, the U.S. Supreme Court has held blue laws as constitutional numerous times, citing secular bases such as securing a day of rest for mail carriers,  as well as protecting workers and families, in turn contributing to societal stability and guaranteeing the free exercise of religion. The origin of the blue laws also partially stems from religion, particularly the prohibition of Sabbath desecration in Christian Churches following the first-day Sabbatarian tradition. Both labour unions and trade associations have historically supported the legislation of blue laws. Most blue laws have been repealed in the United States, although Indiana banned the sale of alcoholic beverages on Sundays until repealed on February 28, 2018, and many states ban selling cars on Sundays. On the venerable Day of the Sun let the magistrates and people residing in cities rest, and let all workshops be closed. The first occurrence of the phrase blue laws so far found is in the New-York Mercury of March 3, 1755, where the writer imagines a future newspaper praising the revival of "our Connecticut's old Blue Laws". 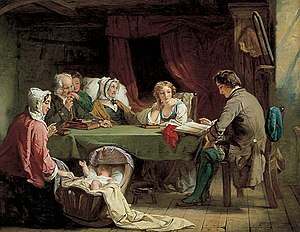 In his 1781 book General History of Connecticut, the Reverend Samuel Peters (1735–1826) used it to describe various laws first enacted by Puritan colonies in the 17th century that prohibited various activities, recreational as well as commercial, on Sunday (Saturday evening through Sunday night). Sometimes the sale of certain types of merchandise was prohibited, and in some cases all retail and business activity. Contrary to popular belief, there is no evidence that blue laws were originally printed on blue paper. Rather, the word blue was used in the 17th century as a disparaging reference to rigid moral codes and those who observed them, particularly in blue-stocking, a reference to Oliver Cromwell's supporters in the parliament of 1653. Moreover, although Reverend Peters claimed that the term blue law was originally used by Puritan colonists, his work has since been found to be unreliable. In any event, Peters never asserted that the blue laws were originally printed on blue paper, and this has come to be regarded as an example of false etymology, another version of which is that the laws were first bound in books with blue covers. Many European countries[ which?] still place strong restrictions on store opening hours on Sundays, an example being Germany's Ladenschlussgesetz. The Supreme Court later concluded, in R. v. Edwards Books and Art Ltd.,  (2 S.C.R. 713) that Ontario's Retail Business Holiday Act, which required some Sunday closings, did not violate the Charter because it did not have a religious purpose. Nonetheless, as of today, virtually all provincial Sunday closing laws have ceased to exist. Some were struck down by provincial courts, but most were simply abrogated,  often due to competitive reasons where out-of-province or foreign merchants were open. In the Cook Islands, blue laws were the first written legislation, enacted by the London Missionary Society in 1827, with the consent of ariki (chiefs). In Tonga, the Vava'u Code (1839) was inspired by Methodist missionary teachings, and was a form of blue law. In Niue, certain activities remain forbidden on Sunday, reflecting the country's history of observing Christian Sabbath tradition. Prior to 1994, trading laws forbade sale of certain products on a Sunday; the distinction between those that could and could not be sold was increasingly seen as arbitrary, and the laws were inadequately enforced and widely flouted. For example, some supermarkets would treat the relatively modest fines arising as a business cost and open nonetheless. The Sunday Trading Act 1994 relaxed restrictions on Sunday trading. 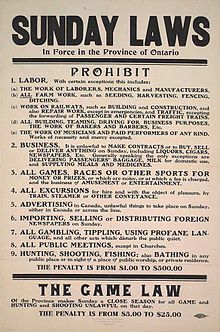 This produced vocal opposition from bodies such as the Keep Sunday Special campaign, and the Lord's Day Observance Society: on religious grounds, on the grounds that it would increase consumerism, and that it would reduce shop assistants' weekend leisure time. The legislation permits large shops (those with a relevant floor area in excess of 280 square metres) to open for up to six hours on Sunday between the hours of 10 am and 6 pm. Small shops, those with an area of below 280 square metres, are free to set their own Sunday trading times. Some large shops, such as off-licences, service stations and garages, are exempt from the restrictions. Some very large shops (e.g. department stores) open for longer than six hours on a Sunday by allowing customers in to browse 30 minutes prior to allowing them to make a purchase, since the six-hour restriction only applies to time during which the shop may make sales. Its requirement is a cessation from labor. In its enactment, the legislature has given the sanction of law to a rule of conduct, which the entire civilized world recognizes as essential to the physical and moral well-being of society. Upon no subject is there such a concurrence of opinion, among philosophers, moralists and statesmen of all nations, as on the necessity of periodical cessation from labor. One day in seven is the rule, founded in experience and sustained by science. ... The prohibition of secular business on Sunday is advocated on the ground that by it the general welfare is advanced, labor protected, and the moral and physical well-being of society promoted. Another feature of blue laws in the United States restricts the purchase of particular items on Sundays. Some of these laws restrict the ability to buy cars, groceries, office supplies, and housewares among other things. Though most of these laws have been relaxed or repealed in most states, they are still enforced in some other states. ^ a b Fuller, Wayne E. (October 1, 2010). Morality and the Mail in Nineteenth-Century America. University of Illinois Press. p. 93. ISBN 9780252091353. ^ a b c d Goldberg, Steven (2000). Seduced by Science: How American Religion Has Lost Its Way. NYU Press. p. 106. ISBN 9780814731055. ^ a b c d Smith, Christian (2003). The Secular Revolution: Power, Interests, and Conflict in the Secularization of American Public Life. University of California Press. p. 319. ISBN 9780520230002. ^ O'Flaherty, Edward; Petersen, Rodney L.; Norton, Timothy A. (September 7, 2010). Sunday, Sabbath, and the Weekend: Managing Time in a Global Culture. Wm. B. Eerdmans Publishing. p. 167. ISBN 9780802865830. ^ "Encyclopedia of Religion and Ethics (New York: Scribner, 1928)". ^ Snopes.com: American "blue laws" were so named because they were originally printed on blue paper.. Retrieved July 12, 2006. ^ Fahlbusch, Erwin; Bromiley, Geoffrey William (2005). The Encyclopedia of Christianity. Wm. B. Eerdmans Publishing. p. 787. ISBN 9780802824165. ^ Roy, Christian (2005). Traditional Festivals: A Multicultural Encyclopedia. ABC-CLIO. p. 457. ISBN 9781576070895. However, an amendment was made that left is enforcement to the discretion of the provinces, so that it remained a dead letter in mostly French Quebec. A Catholic Sunday League was formed in 1923 to combat this laxity and promote sabbatarian restrictions in that province--especially against movie theaters. ^ Kyle G. Volk (2014), Moral Minorities and the Making of American Democracy. New York: Oxford University Press. ISBN 019937192X. ^ "North Dakota Catholic Conference says 'Sunday law' Benefits All People". EWTN News. September 19, 2011. Retrieved July 5, 2017. ^ "CanLII – 1985 CanLII 69 (S.C.C.)". Canadian Legal Information Institute (CanLII.org). September 3, 2009. Archived from the original on May 9, 2011. Retrieved September 24, 2009. ^ "Allan Levine: Never mind Ford Nation. Hogtown has a long history of drunks, tyrants and loudmouths running City Hall". Retrieved February 2, 2017. ^ Raynault-Ollu, Louis-Philippe (2012). "Sunday Observance Laws in North America". SSRN Electronic Journal. doi: 10.2139/ssrn.2260582. ISSN 1556-5068. SSRN 2260582. ^ "Lov om ændring af lov om detailsalg fra butikker m.v. - Liberalisering af reglerne om åbningstid" [Act Amending the Law on Retail Sales from Shops, etc. - Liberalization of the Rules on Opening Hours]. Act No. 543 of 26 May 2010 (in Danish). Danish Civil Protection Agency - retsinformation.dk. Retrieved September 23, 2018. ^ "Trading hours for retailers: the law". Retrieved January 27, 2016. ^ Henry McDonald. "New bid for Sunday football". the Guardian. Retrieved January 27, 2016. ^ "Seasonal and Sunday Trading". Retrieved March 10, 2016. ^ "Poland limits Sunday shopping to benefit family life". Business Insider. Retrieved January 30, 2018. ^ Ph.D., Prof. David J. Hanson,. "Alcohol Blue Laws (Laws Prohibiting Sunday Sales of Alcoholic Beverages)". Retrieved September 28, 2016. ^ Montgomery, Bob. "Gaffney churches seek to stop Sunday alcohol sales". Retrieved September 28, 2016. ^ "Title 17, §3204: Business, traveling or recreation on Sunday". Retrieved January 27, 2016. ^ "A turkey of a blue law", Boston Globe. Retrieved November 25, 2006. ^ a b Coffman, Elesha (2009). "Bye-Bye, Blue Laws?". Christianity Today. Retrieved July 6, 2017. ^ Kyle G. Volk, Moral Minorities and the Making of American Democracy (Oxford, 2014), 59-68, 190-201. ^ McGOWAN v. MARYLAND, 366 U.S. 420 (1961), Supreme Court of the United States, Decided May 29, 1961. Retrieved August 10, 2007. "The present purpose and effect of most of our Sunday Closing Laws is to provide a uniform day of rest for all citizens; and the fact that this day is Sunday, a day of particular significance for the dominant Christian sects, does not bar the State from achieving its secular goals." ^ The LANDMARK Cases, National Sunday Law Crisis. Retrieved May 21, 2008. ^ "'Blue Law' for car sales upheld by Judge" Archived May 31, 2008, at the Wayback Machine, KVIA, March 22, 2006. Retrieved May 28, 2008. "A Texas judge has upheld an old law that requires car dealerships in the Lone Star state to close one day each weekend. They must now choose to open either Saturday or Sunday." Volk, Kyle G. (2014). Moral Minorities and the Making of American Democracy. New York: Oxford University Press. ISBN 019937192X.